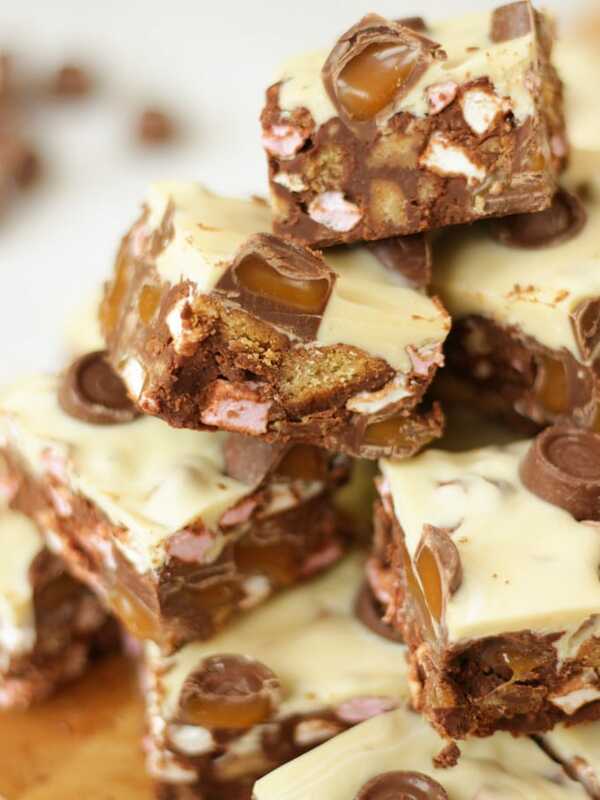 Easy Rolo Rocky Road Recipe - Quick and DELICIOUS! 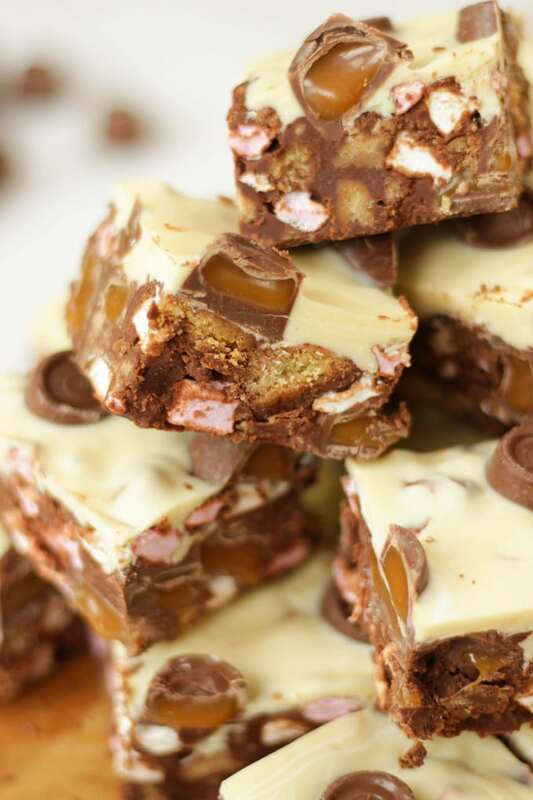 This easy to make Rolo Rocky Road recipe is packed full with delicious chocolate, biscuits, marshmallows and of course.. Rolos! No bake, really quick, packed with caramel Rolos – everyone loves this recipe! 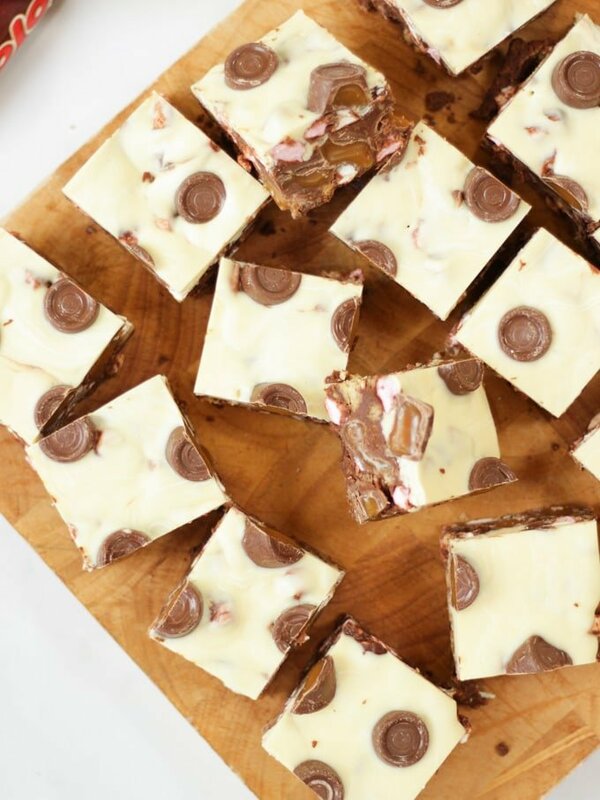 It’s no secret that we LOVE a slab of Rocky Road in this house. 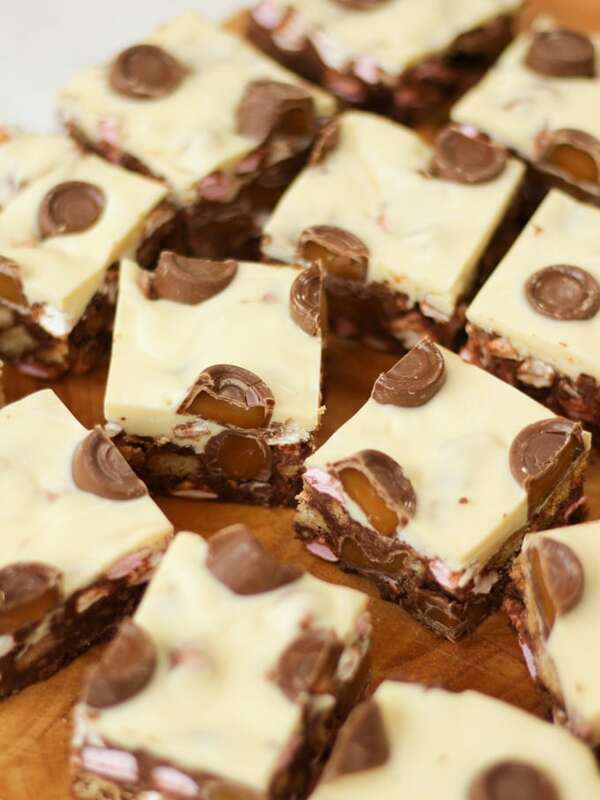 There’s been Malteser Rocky Road, Christmas Rocky Road and of course the Creme Egg Rocky Road. It’s so simple, easily made with bits and bobs you have in the cupboard. It’s also always a show stopper when you give it as a gift or bring it out of the cake tin. How do you make Rolo Rocky Road? 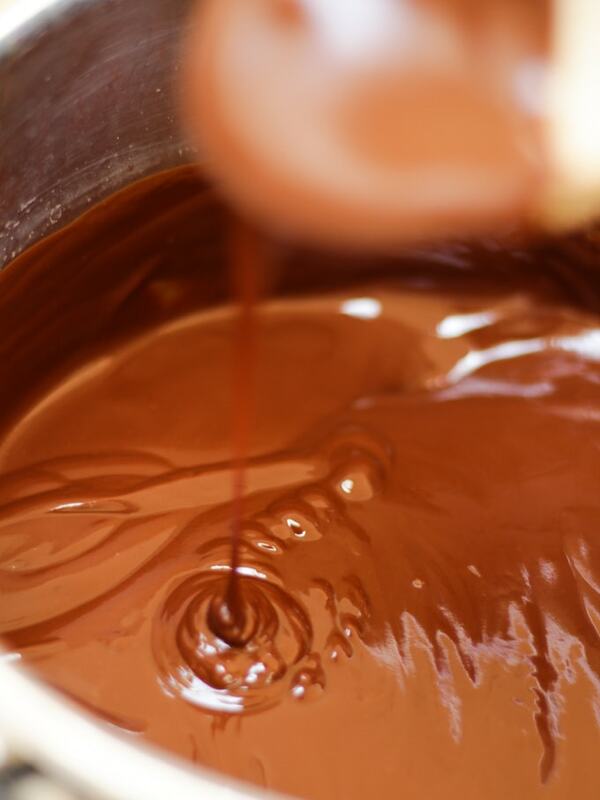 Start by melting your milk chocolate and dark chocolate, along with your butter and golden syrup. Allow this mixture to cool slightly. If you add your marshmallows or Rolos whilst it’s too warm, they will melt into a gooey mess. You should be able to touch the mixture with your finger without feeling the heat. 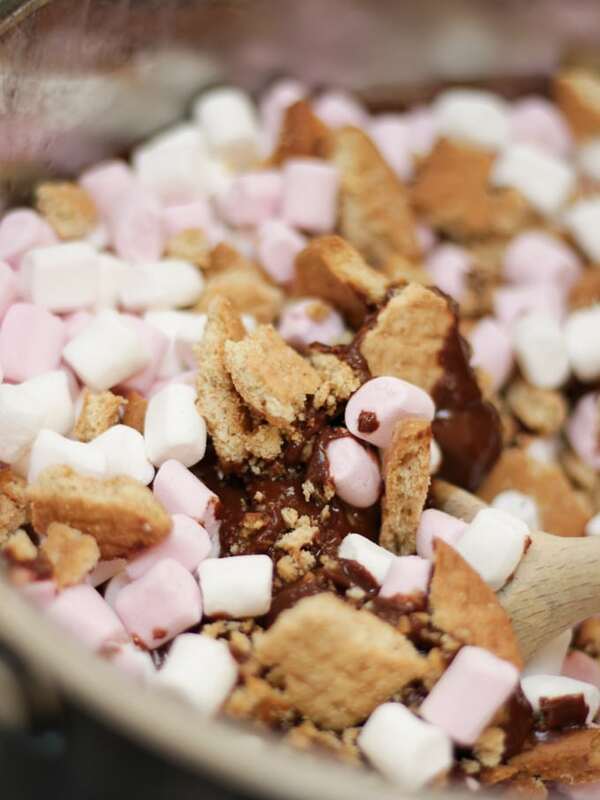 Add your marshmallows, biscuits and Rolos to the mixture and mix in thoroughly until everything is coated. Press into your lined tin and then coat with the white chocolate and more Rolos! Chill until your Rolo Rocky Road is solid enough to cut. If using a saucepan, only use a very, very low heat or the chocolate, butter, syrup mixture will seize and go grainy. I also find it helps to put the butter in first and let it melt a little, so that the chocolate isn’t touching the bottom of the pan. If melting your chocolate mixture in the microwave, use a large bowl and microwave in 30 second bursts, being sure to mix very well between each burst. The mixing is really important as it distributes the action of the microwave and speeds the process up without causing any burning. If the slab of Rolo Rocky Road is too hard to cut straight out of the fridge, allow to come to room temperature for 30 minutes. I use this tin to pour my Rolo Rocky Road into, it is 23cm square. You can use a different size tin, but remember that the slices will be thicker or thinner accordingly. I like to cut up some of the Rolos I decorate the top with as I think it looks pretty, but it’s up to you! Baking Tin – I use a small baking tin for all of my Rocky Road and Brownie recipes. It’s actually a small roasting tin, very similar to this one: Non Stick Roasting Pan 23cm on Amazon. It’s just the right size so that they are the perfect depth. Baking parchment – I use baking parchment or baking paper for almost all of my bakes and cakes. It means no sticking, ever. I buy it in bulk from Amazon so I never run out and it’s also heaps cheaper that way. Not to be confused with greaseproof paper, which needs to be oiled first, not good for no bake cakes. Chocolate – I try to use my favourite Callebaut chocolate for this recipe. This chocolate is just amazing, it melts so well and really makes a difference to any recipe. When you buy it in bulk (1kg bags at a time) from Amazon it works out about the same price as supermarket chocolate. A good investment I think as it really does make SUCH a difference. Fancy some other easy chocolate recipes? How about my Chocolate Orange Cake Recipe or my Nutella Cake Recipe? Hope you enjoy this recipe as much as we do. 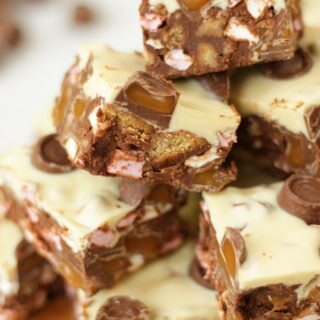 I’d love to know how you got on and what you thought of it if you make this Rolo Rocky Road recipe. Please rate the recipe and leave me a comment below if you do. 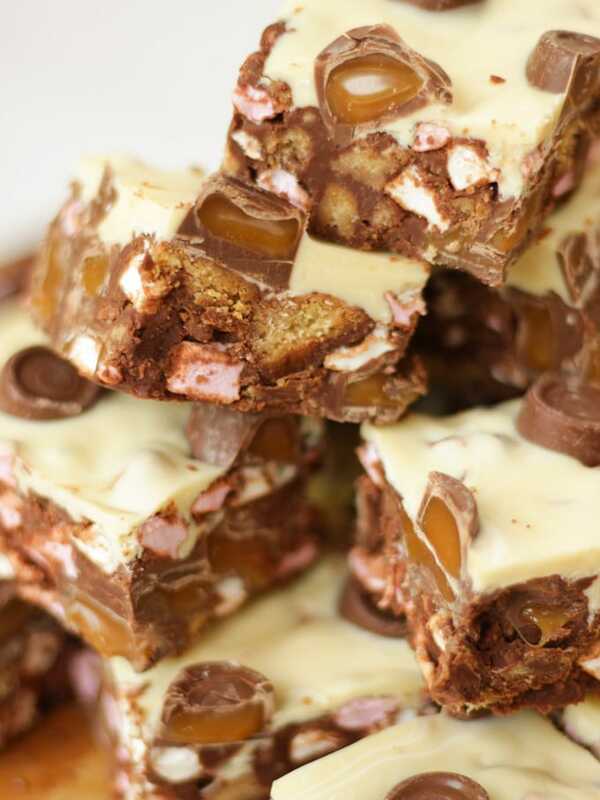 This easy to make Rolo Rocky Road recipe is packed full with delicious chocolate, biscuits, marshmallows and of course.. Rolos! No bake and really quick! 200 g Milk chocolate Broken into chunks. 200 g Dark chocolate Broken into chunks. 150 g Digestive biscuits Crushed into big chunks. Melt the butter, milk chocolate and dark chocolate, with the golden syrup over a very low heat until melted and smooth. Allow to cool for 5 minutes until it's just lukewarm. Stir in the biscuits, marshmallows and about 350g of the Rolos. Mix thoroughly until everything is coated in the chocolate mixture. Pour into a baking tray lined with baking paper and smooth out. Melt the white chocolate, pour over the top and push in the remaining Rolos to decorate. Chill for about 2 hours or more until firm. Cut into chunks.